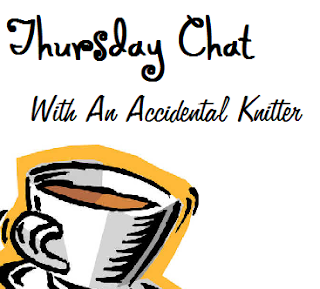 This week I had the pleasure of interview Contessa from Writing, Yarn, Pucks and Diapers! Here is how we got on! What made you want to learn to knit and crochet? "To be honest, I wanted to knit for such a long time that I don’t recall that first moment where I realized I was interested in learning. However, it was during my pregnancy -- for which I’d been put on bed rest -- that I finally got around to learning from a Klutz book. I can’t say learning to knit was great for relieving my stress but it was great for taking my mind of the constant fear of losing my baby. My knitting provided inspiration for my mother to pull out her crochet hooks for the first time in a couple decades. It was watching her race through a scarf the same thickness as the one I was knitting that spurred me to learn how to crochet." Are there any new skills or techniques you would like to learn? 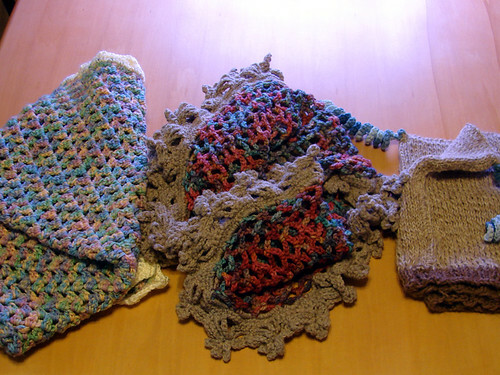 "Every time I think I’ve learned all I want to learn with both crocheting and knitting, I discover another fifty things I need to or want to learn. A technique I’d love to conquer someday is Fair Isle knitting. I’m still quite inexperienced when it comes to color work so I definitely need to get some more of that under my belt before I pursue more difficult undertakings." "I don’t feel like I have a great many real success stories but the day I finally decided to try knitting a sock is definitely “up there” among my successes. 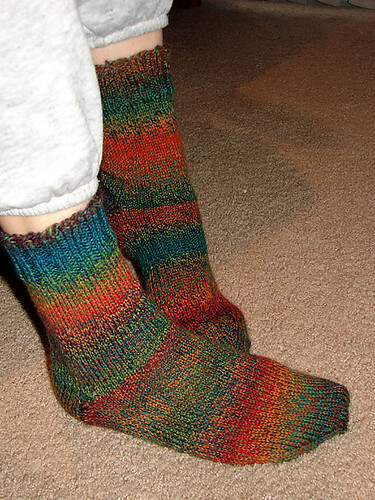 I’d heard nightmare stories about gussets and turning heels and strangely enough, the thing I messed up with my first sock was shaping the toe. I consider that pair a great success because I learned so much from them and they get the (second) most use out of any of my other projects. (My current purse is a knit mesh bag and gets used most but I don’t consider it a big success because it wasn’t as big a deal to make as was my first pair of socks.)" Have you ever dared to create your own patterns? "Ha, “dared” is exactly the right word when it comes to creating my own patterns. I’ve attempted a shawl and a Mobius wrap without patterns and both resulted in some pretty unsatisfactory garments. I’m not giving up, though. I feel it’s my lack of understanding for shaping that is holding me back the most. When I start a new project, I’m following a pattern but not really giving any thought to what each portion of the pattern is contributing to the final product -- nor do I really understand how it all comes together in the end (I just trust that it does). Recently I’ve changed my approach to reading patterns and I’m hoping that will result in an eventual ability to create my own designs. Do I think anyone would pay for my designs? Doubtful. But I’d have no problem offering them for free if it meant people actually used them and enjoyed them! When it comes to designing, I’m much more a jeweler than I am a seamstress (or toy-maker, when it comes to amigurumi)." 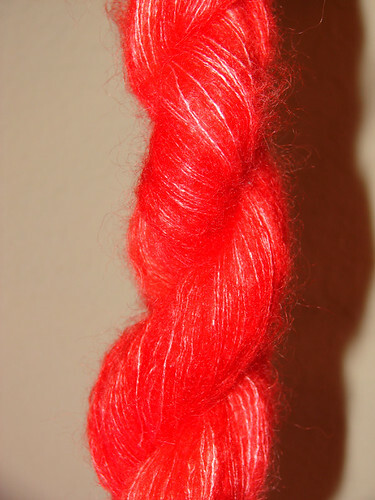 We all love hand-spun, and hand-dyed, have you ever tried spinning or dyeing yarn? 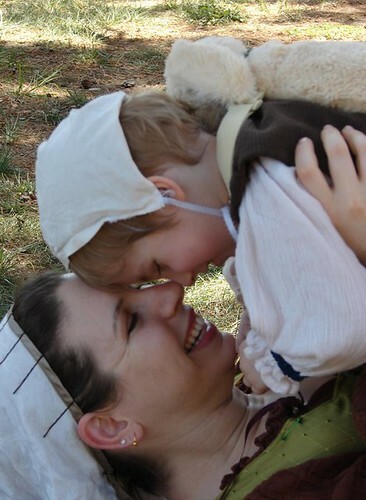 "Several years ago while at the Southern California Renaissance Pleasure Faire, I purchased some roving and a drop spindle after watching some women spinning their own yarn. That roving, I am sad to say, is still in its roving-state and still in its original packaging. At least I can say the drop spindle has since been looked at though it still hasn’t been used. Happily I can say I have dyed my own yarn. I started at the end of 2010 with a skein of Patons Classic Wool and a couple packets of each color (I mean “flavor”) Kool Aid. I threw everything into a slow cooker and the rest is history. I took a several month break from dyeing but with the opening of a friend’s online store (Candy Skein by Tami), I was inspired to get the slow-cooker and punch drink packets back out." Big thanks to Contessa for her wonderful answers and allowing us to pick her brain!